As its first play for 2012, PETA introduces the first-ever Filipino adaptation of William Shakespeare's King Lear. Set in a post-nuclear world that is strangely contemporary and familiar, Shakespeare's King Lear receives a fitting, royal makeover, fashioned by a pool of Filipino theater giants. Haring Lear will be shown at the PETA Theater Center in Quezon City on January 27 to March 4, 2012. National Artist for Literature, Bienvenido Lumbera translates the text into prose while retaining the rhythm, texture and elegant brutality of Shakespeare's tragedy. Acclaimed theater director, Nonon Padilla then turns the epic classic into a modern-dress contemporary family drama, while World Stage Design Awardee Gino Gonzales establishes the dark aesthetic, settings and styles of the play. Exciting, suspenseful and virtually violent, PETA's Haring Lear retains Shakespeare's beautiful and devastating themes of the disintegration of family solidarity, running the gamut of love, madness, death and sacrifice. 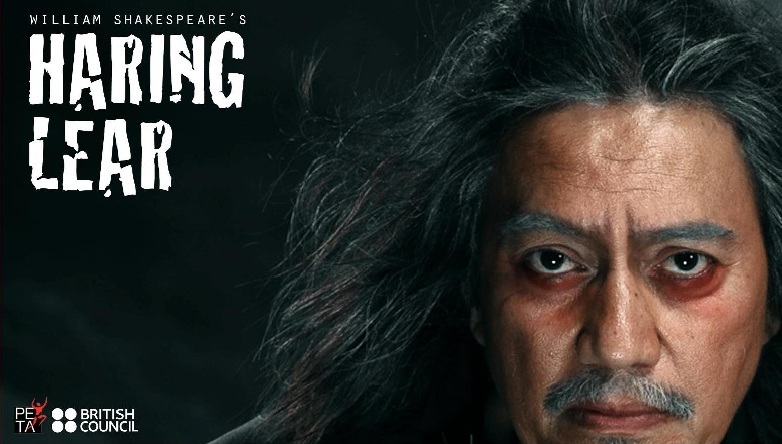 'Haring Lear' features a traditional Shakespeare all-male cast helmed by theater stalwart Teroy Guzman who plays the role of the aging monarch, Haring Lear. Other cast includes: Gary Lim (Regan), Nor Domingo (Goneril), Abner Delina (Cordelia), Jay Gonzaga (Edmundo), Myke Salomon (Edgardo), Jack Yabut (Gloster), Josel Reyes (Kent), George De Jesus (Oswaldo), Jeff Hernandez (Duke ng Cornualles), Renante Bustamante (Duke ng Albanya), Fredyl Hernandez (Duke ng Burgonia), Angel Moratilla (Hari ng Francia) and Ernie Cloma (Matandang Lalaki). Note: I put an asterisk for February 18 (Sat.) because the day has a different schedule, compared to the rest of the Saturday shows. For ticket inquiries, please contact (632) 7256244, 4100821-22, +63.917.5765400. You can also email petatheater@gmail.com or visit their website: www.petatheater.com.